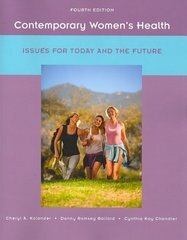 Contemporary Women's Health: Issues for Today and the Future 4 Edition Contemporary Women's Health provides a balanced, comprehensive understanding of the health issues affecting women. Health information is presented within the context of the social and political forces affecting women of all ages, races, and ethnicities. Prevention, health promotion and becoming a wise health care consumer are emphasized throughout the text, while the impact of lifestyle issues and relationships throughout the lifespan on women's health are explored.